Not only an old fort of the WWI, but at present also the highest museum of Europe. It was 1977 when the renowned alpinist Reinhold Messner conceived the idea of restoring the fortification of Monte Rite (2.181m) and – after a long work, in renovating and transforming the architecture of the building – he inaugurated in the summer 2002 the “Museum in the Clouds”, which owes his name to the great 360° panorama that can be admired on its top: the view ranges over the clouds, starting from south with the Monte Schiara and Agner, the group of Sfornioi-Bosconero, then crosses over Civetta and Pelmo, overlooks the “royal pair” Marmolada and Antelao, catches even the Tofana of Rozes, move on the Marmarole and, to close the circle on the other side of the valley of the Piave River, gazes far on the northern horizon at the skyline of Tudaio and Cridola and finally turns to Spalti di Toro and the Duranno at east. The museum itself offers a lot, from the history of the region and its inhabitants through the centuries to collection of paintings and other temporaries exhibitions. It is open from 1st June till the end of September and you can find the latest updates on the Museum Program here. 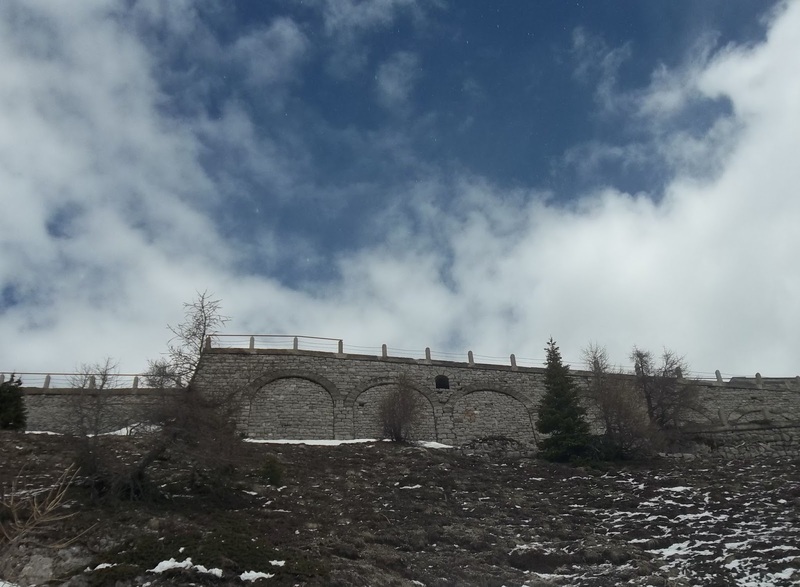 The museum is however only a reason to visit Monte Rite, and not the main one for us, who would rather suggest a simple, yet very impressive itinerary related to the Great War. Monte Rite is placed on the crossroad of three of the most important valleys of the Dolomites – Ampezzo, Cadore and Zoldana – and had therefore a high strategic importance. That’s why the Italian Army started to build a fort on its summit already before the beginning of WWI, since about 1911. The buildings, with the storehouse, the cooking area and barracks that could host about 500 men, were connected with the valley by a mule track, that run then to the summit, where a military observatory was placed. As the Great War started the fort was not completed, nevertheless it became a defensive position from June 1915. Yet he was never at the really frontline: after the rout at Caporetto it was abandoned. There are many ways to reach the summit – the most interesting one it’s maybe the path n. 494, which starts about 1km before the Passo Cibiana arriving from Forno of Zoldo and runs constantly through the wood. We’d like to suggest you however the shortest one (the ascent on the path takes about 1 hours), with starting point Passo Cibiana, so that you can have more time to spend on Monte Rite and on the ring path of its summit. The itinerary is very simple and even inexperienced hikers can undertake it, walking on the large mule track or eventually taking the shuttle bus to the “Museum in the Clouds”, available during the opening season (for fee, timetables and contact, see here; think about that during the summer the parking in the valley, the museum, as well the mule track may be quite crowded). For those who want to have a walk, instead, and to enjoy so the landscape at full, we suggest to park near the Rifugio Re Mauro or in one of the many areas nearby (pay attention, some of them are with fee), then walk along the mule track for about 10 minutes till you reach two small wood-houses. At the next bend you’ll see on the left a signpost that indicates the starting point of the panoramic path (the n.479, also called “Sentiero Col de Orlando”) entering in the conifer wood. The trail is really narrow and steep, maybe slippery with rain or snow, but presents no difficulties and the view, especially on the Group of Bosconero, is great. As soon as you come out from the trees, you have to cross some meadows before reaching the mule track and then, short after, the Forcella Deona. This is the first panoramic point which directs immediately your look to Antelao. If you follow the mule track you can reach in about 15 minutes the refuge and the museum-fort, but we suggest to proceed first on the ring path of Monte Rite. An information panel at Forcella Deona describes the main features of the 6 km trail: it takes about 1.30 hours and some equipped passage facilitate the walk, that has however to be undertaken only with good weather conditions and by trained hikers. Follow the indications and walk the small trail that runs around Monte Rite: you can reach so the different panoramic points, especially the Col Sette Prede, the Croce del Rite (on the peak of Monte Roan) and finally the top of Monte Rite. On this ring path you will discover remains of the WWI, many information panels describe moreover the flora and fauna of the surrounding. If it’s a sunny and clear day, the 360° view from the top of Monte Rite is indescribable, as we said; and even in a cloudy and snowy day (as this year was oft in the Dolomites till June) you can enjoy the view, breathe and imagine with the clouds. Close then the ring path and descend to the near fort that host the Museum – a visit is worth. Before coming back home, you can eat something and rest at the Dolomites Refuge, just walk 5 minutes on the descending mule track. Way back to Forcella Cibiana always on the mule track on feet or with the shuttle bus.